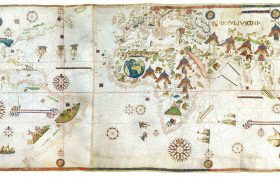 In 1531, Italian sailor and cartographer Vesconte Maggiolo created a “Portolan planisphere,” a navigational chart of the known world, that included the first depiction of the eastern seaboard and therefore of New York harbor. Bloomberg tells us that the 6.7′ x 3′ map made of six goat skins is now in the possession of rare book and map dealer Daniel Crouch, who will put it up for sale for a whopping $10 million this Saturday at TEFAF art fair. If it fetches this price, it’ll become the most expensive map ever publicly sold.